Yesterday we covered step 1. 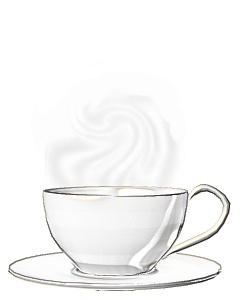 Today I want to concentrate on the second step - Doing the prep. work - and in order to show you exactly how to do this, I will continue with our example. Prep work is often the thing that takes the most time, which is why I count it as a separate step. You can of course do all of this on your cook ahead day as well. Whether you do it ahead of time, or do it just before cooking, doing all the prep work together will save you a lot of time. For example it's a lot easier to chop all the onions you need for all your recipes at one go rather than stop several times during the process to get out your knife and cutting board yet again. For most people who work outside the home, doing the prep one evening during the week and then storing the ready prepared ingredients in their fridge until their cook ahead day makes more sense. If your time is limited, it's a lot easier to spend an hour one night preparing. Then all you will need is probably just another good hour on your cook ahead day for the cooking and freezing. So let's get back to my example. If you remember I want to make 3 dishes on my cook ahead day - Italian beef soup, lemon chicken, and some hamburgers. I've made my shopping list and I've bought my supplies, now I want to make my prep. lists. Again, using the form from LifeYourWay.com, I am going to print out 3 Master To Do lists. Now what I want to do is check my recipes and list all the things that I can do ahead of time before actually preparing the recipe. In order to do this I need to look at the recipe as a whole, not just the directions. Let's take my Italian beef soup recipe for instance. ** If you use fresh cauliflower make sure you put it in first and don't mix the soup. Fresh vegetables take the longest to cook so need to be at the bottom of the pot. As you can see, the directions are pretty simple, but in order to do them quickly and easily, you first need to have your ingredients ready in the proper form. Taking a whole medium onion and plopping it into your slow cooker won't work! So when making your prep list, check the ingredients list first. The first ingredient is stewing beef. If you have bought your beef already cut as stewing beef, you are ready to go, but if you are using a piece of cheaper steak for instance, then you will need to cut it up first, so the first item on your prep. To Do list will be "cut up beef into cubes." Your second item will be "chop onion." and so on. When you are making up your lists, it's best to put all the possible steps, even if at this particular time you don't need them. I have listed cutting up cauliflower if I want to use fresh, even though the recipe calls for frozen. This way, if cauliflower is in season, I can take advantage of the lower price. You also want to list anything you need to defrost ahead of time, such as the beef stock. If you are using fresh herbs or vegetables from your garden, list picking, washing and storing in your fridge on this list as well. Basically, anything that can be done ahead to make your cook ahead easier you want to list on your prep list. So here are the prep. lists for the Italian beef stew, the lemon chicken, and the burgers. You will notice that there are no prep. steps for making burgers, but I want you to make a list anyway and keep it with the rest of your cook ahead plan. Just write N/A on it. At some point later when you want to make this as part of another cook ahead plan, you will be quickly reminded that there are no prep. steps for this dish. Now, just as with your shopping lists, you want to incorporate these all into one prep list for this particular cook ahead plan. 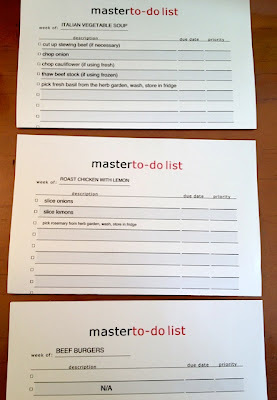 Using a clean Master To Do List, list all the to do steps from all 3 plans, grouping them together as much as possible. 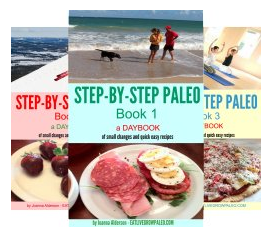 If you have to cut up any meat, chicken or prepare seafood list all these steps together first. Then group all the slicing together and then all the chopping, and anything else that needs to be done. 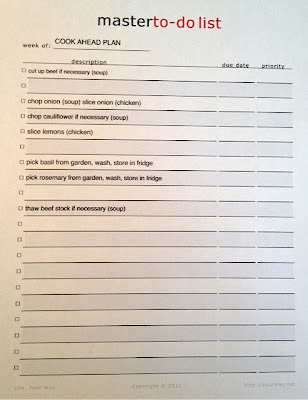 One important hint - list in what dish the food will be used when you list each step. For example, if you are chopping onions for two different recipes, list them both in brackets following the step. 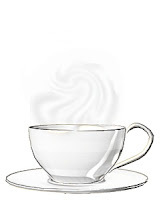 This way you can quickly check by glancing at your recipe whether you have forgotten anything. I hope you can see now that as long as you do this step by step and recipe by recipe, it's not that complicated. It's when you try to do everything at once that it can get overwhelming. 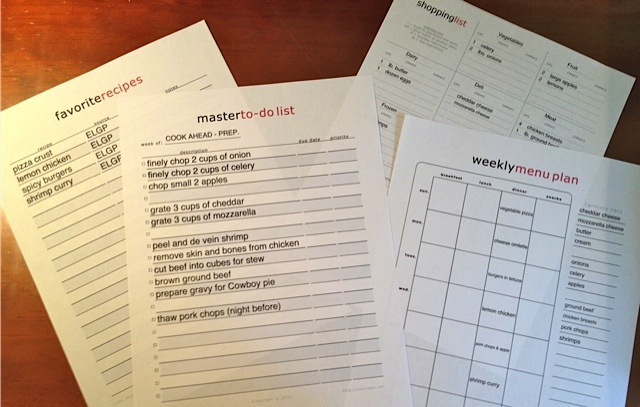 Using this method you can create any cook ahead plan you want with any number of dishes. Just work on one recipe at a time. It isn't necessary to be perfect either. This is why I use printed forms. I keep them by me all through the process and add notes as I go. If I find I've forgotten something - no problem - I just add it where necessary. If your sheets start getting ratty, again no problem. Just retype a clean version, print it, and your ready to go again. In a professional kitchen, all the chefs have a prep team to prepare all the food ahead of time for them. This is why they can produce wonderful quality meals for you in a short period of time. In your home, unless you're lucky enough to be able to rope in some helpers, you are both chef and prep. chef. Dividing up this chore into two separate work sessions can make it easier to both do yourself or to delegate. Once your ingredients are prepared, all we have left is our last step - which is the actual cooking and freezing - and I will cover this tomorrow. 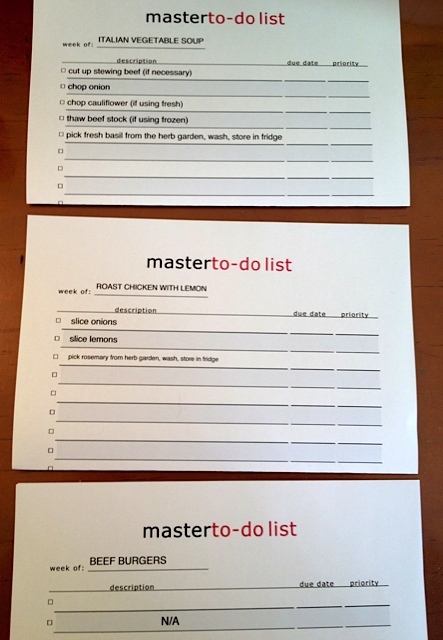 Print out 4 copies of the Master To Do list form here. Make a prep. list for each of your three recipes. Make a Master prep. 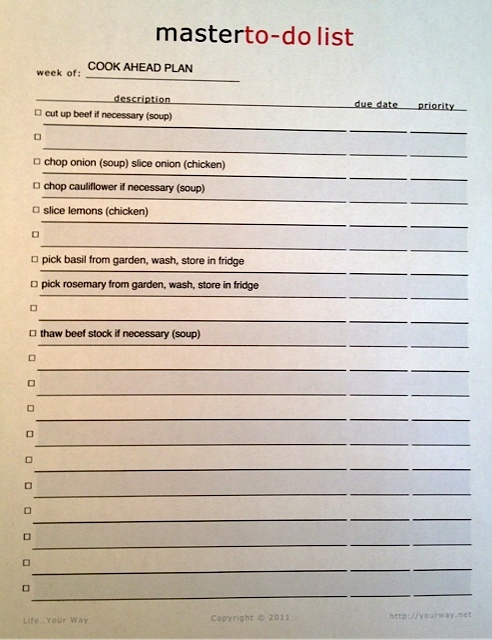 list for your Cook Ahead Plan. Well done! We're two thirds of the way there! Now we just need to make our cooking day lists and we're finished. See you tomorrow.